Basia Dziewanowska is a Polish folkwear and art specialist whose life is dedicated to promoting Polish culture in a multicultural, creative context. She grew up in the United States surrounded by Polish art and ethnic crafts, while absorbing an understanding of Polish traditional family life. Basia lectures, organizes exhibits, interprets, consults, teaches cooking classes and folkcraft workshops (including paper cutouts, called Wycinanki, and egg painting, called Pisanki), and presents exhibits for museums, festivals, and folk dance gatherings around the world. 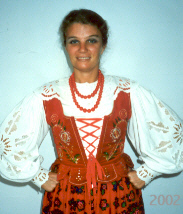 Since 1971, she has been importing and disseminating information about authentic Polish costumes, footwear, weavings, folk art, toys, educational materials, food delicacies, and Polish-American heritage items. Basia is the daughter of Ada Dziewanowska and the sister of Jaś Dziewanowski, famed Polish folk dance instructors and choreographers. Her father, Kamil, is an internationally known Polish historian, scholar, and author. From the age of six, Basia danced with Polish performing groups in the United States and Poland, while continually learning about costumes, dance, music, and customs. 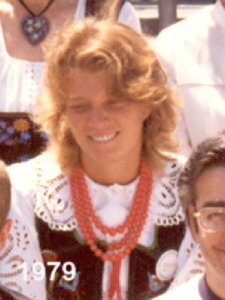 In 1987, she founded the annual Polish Dance, Music, and Family Camp from 1987 to 1990, which focused mainly on dance but also featured many other cultural activities for all ages. Each year's camp explored a theme or region through its choreography, costuming, crafts, customs, folklore, and instrumentation, bridging the gap between Polish and American cultures in a village-like setting and immersing attendees in the culture. She directed the camp for four years. For many years, Basia has conducted various children's programs at Buffalo Gap International Camps. Wherever she goes, she also sets up her "store" for those who are in need of Polish costume pieces, boots, shoes, mocassins, crafts, and more. After receiving a BA in Art History from Boston University, Basia went to Poland for nine years. There she studied fashion, unique textile design, and photography under Kościuszko and Polish State scholarships. She earned a BFA and an MFA from the Łódź Academy of Art. She danced with a performing group in Poland, attended choreography and folk-art courses, and did ethnographic research and documentation. Active in her community, Basia has been a Massachussetts representative to the National Folk Organizaton (NFO) of the United States. She also has been an affiliate of the Folk Arts Center in Cambridge, Massachussetts. Basia was an interpreter for Polish families who flew to the United States for complicated operations on their blind premature babies -- a job she really enjoyed. In 2001, Basia translated the Individual Education Program Forms for Braintree High School with the help of an individual who had Microsoft Word in Polish. Because of the September 11, 2001, attacks on the United States, Polish families became afraid to fly into Logan Airport and she lost her interpreter position. She started a Polish children's performing group in Salem, Massachusetts. Polish Folk Dances and Songs: A Step-by-Step Guide. New York: Hippocrene Books, 1997, by Ada Dziewanowska, Basia Dziewanowska, Jaś Dziewanowski, Staś Kmieć, and Jacek Marek. This work contains in-depth descriptions of over 90 of Poland's most characteristic and interesting dances, including the national dances: the Polonez, the Mazur, the Kujawiak, the Oberek, and the Krakowiak, as well as selected regional dances from the five ethnographic areas of Mazowsze, Małopolska, Silesia, Wielkopolska, and Pomorze. She is currently working on a book of Polish folkwear. Since 1997, a hip replacement that wasn't totally successful has curtailed some of Basia's dance activities, but she continues to conduct programs and run her folk apparel store at folk dance camps and workshops.